Imperial is proud to present its newest sofa to the team! The First Team Sofa replaces the retired Pub Sofa and features a brand new look. A little longer, a little deeper and a little taller! It sits great and make the perfect seat for the game! 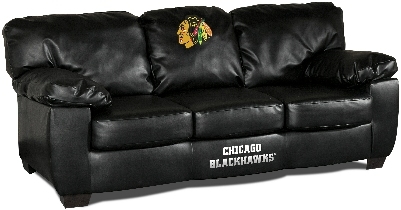 This official NHL licensed plush, oversized sofa is perfect for 2-3 grown men or the entire family to watch the game! It features premium compression foam for ultra comfort and durability and virgin hollow fill fiber for extra softness.